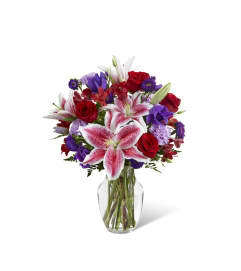 The FTD® Timeless Elegance™ Bouquet is an inspired work of floral art that blends a variety of colors from vibrant to whisper soft in a bouquet, never to be forgotten. 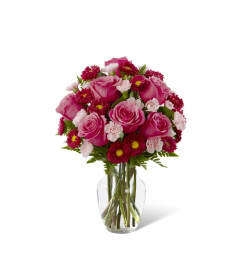 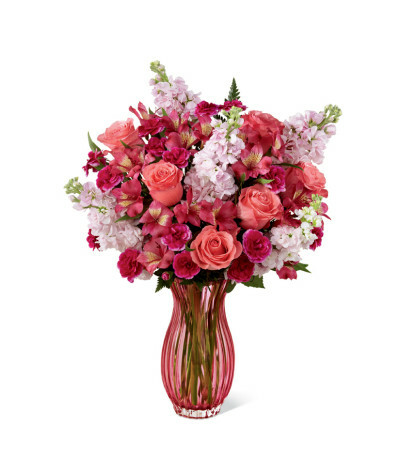 Stunning coral roses, fragrant pink gilly flowers, fuchsia mini carnations, dark pink Peruvian Lilies and lush greens are beautifully arranged in a blushing heavy glass keepsake vase. Makes a perfect impression on Mother's Day or any day you want to express your love - birthdays, anniversaries, or for "Thank You" and "Get Well Wishes".